8-Grain 3 Seed Bread for sale. Buy online at Zingerman's Mail Order. Gourmet Gifts. Food Gifts. Good for you, though it doesn't taste like it. 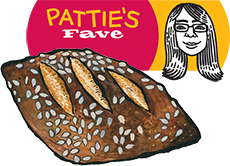 Pattie Lambka is a service center supervisor and trainer extraordinaire at Zingerman's Mail Order. I love our 8 Grain 3 Seed Bread.... Why? Although there are so many grains and seeds, it still seems like a sinful treat because the honey sweetens it. When I eat it, I feel like I've made a healthy choice. The crust is hearty, the interior is still pretty soft and chewy especially when you pop it in the toaster. My favorite way to enjoy it is toasted and topped with a little cream cheese and some Early Glow Strawberry Preserves. I also like to top with Koeze peanut butter. Sometimes I go wild and melt cheese on top! The wheat flour and many of the grains in this bread are all organic.